There is no question that combustible dust is a serious problem in the industrial and commercial workplace. Although some agencies have stated there were less than 300 fire and explosion incidents related to combustible dust in the United States from 2000 to 2005, media investigations have found as many as 12 incidents per week may be a more realistic number. Whether you agree with professional estimates or accept media findings, several large incidents have gained enough national recognition through loss of lives and financial impacts that OSHA has begun making tentative efforts towards putting together an actual combustible dust standard and implementing it. Although the Sept. 10 Upper Big Branch mine explosion in West Virginia that killed 29 miners led to an emergency mine dust ruling that as of June 2011 has become permanent, this ruling is not comprehensive, nor does it apply to all industry. As of this writing, OSHA has yet to institute a solid set of standards for combustible dusts. Many officials adopt NFPA recommendations into their local fire codes as a result in order to attempt some level of regulatory standards across a broad spectrum. Whether or not any meaningful regulation emerges from OSHA in the near future, it is best that any industry or commercial operation associated with combustible dusts be preemptive and adhere to any local regulations as well as adopt their own measures and enforce them. The potential for injuries and catastrophic damage are simply too high to justify waiting for enforced adherence when the information and equipment necessary to take preventative measures is already so readily available. Most industries where combustible dust is a concern do indeed work towards creating the safest workplace possible. Managers, operators and workmen are trained and kept up to date on procedures and proper operations, equipment is chosen for hazardous location suitability and inspected regularly, and local ordinances and standards instituted. The NEC and NFPA have made identifying and classifying hazardous locations a fairly simple matter, and international cooperation has led to a slow but steady gravitation towards a zone based standard being accepted worldwide for homogeneity. Despite this, there still exist a wide disparity in practices and levels of vigilance that continue to result in serious incidents occurring all too frequently. Aside from training, one of the biggest subjects that continually draws repeat citations from regulating bodies is equipment and its proper installation and use. Many incidents resulting in fires and injuries have been found to be the result of a lack of equipment, improper operation and or maintenance of equipment, and equipment that was not properly rated for a particular hazardous environment. In some instances it is understandable that there may be some confusion leading to mistakes as some equipment manufacturers may be somewhat misleading or unclear in the marketing of explosion proof equipment. One of the biggest examples of this can be found with equipment that is marketed as being vapor or dustproof, with little clarification of its lack of UL or ETL explosion proof approval. Although it is the responsibility of operators to ensure their equipment carries the proper approval, such misleading marketing can be confusing enough to cause problems even for experienced operators. The only way to ensure the suitability of equipment for hazardous locations is to be certain it carries the required labeling and that all accompanying documentation of approval is present. Without a clear and readily visible approval, any equipment being considered should be considered out of compliance and passed over. Further, it is critical that equipment be properly chosen according to its classification. For locations where combustible dust is present, a Class 1 Division 1 rating is going to be out of compliance as it is geared towards gases and vapors and not flammable particulates. This illustrates for us the importance in differentiating between classifications and how critical properly matching equipment to conditions is. Just because a unit carries an explosion proof approval does not make it suitable for all hazardous locations. Clear documentation and a good working knowledge of classification ratings is necessary in order to ensure the maximum protection possible with any given piece of equipment. 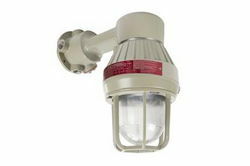 A Larson Electronics HAL-LI-48-2L-LED Explosion Proof LED Light for example would be good for both vapors and dusts due to its Class 1 Division 2 and Class 2 Division 2 ratings and clear documentation affixed to the fixture itself, while another light rated Class1 Division 1, but not carrying any documentation, would be not be considered within compliance for a location where dust is present. In addition to training and equipment, diligent maintenance must also be followed to maintain safety measures at consistent levels. Especially in industrial environments where equipment can be exposed to heavy wear and damaging elements, particular attention must be given to ensuring the proper operation and condition of explosion proof equipment. Combustible dust environments present a particular challenge due to the fact that even though dust control measures may be in place, dust will accumulate in inconspicuous areas regardless. On top of lighting fixtures, between machinery openings and vents, in corners and along upper surfaces, dust accumulates into layers and becomes a latent danger with explosive potential. Although an area my appear clear, if vibrations or a small primary explosion occurs, this accumulated dust can be dislodged and become suspended in the air, leading to a secondary explosion of great violence. To this end, maintenance in combustible dust environments requires particular attention to a regular schedule of cleaning and inspection to ensure no accumulations. Until OSHA devises and institutes a clear set of standards it is up to operators to take the full responsibility for combustible dust safety. Although implementing the training and equipment necessary entails an added expense that can oftentimes be difficult to absorb, without such preventative measures, an even greater loss is possible that cannot be recovered from.